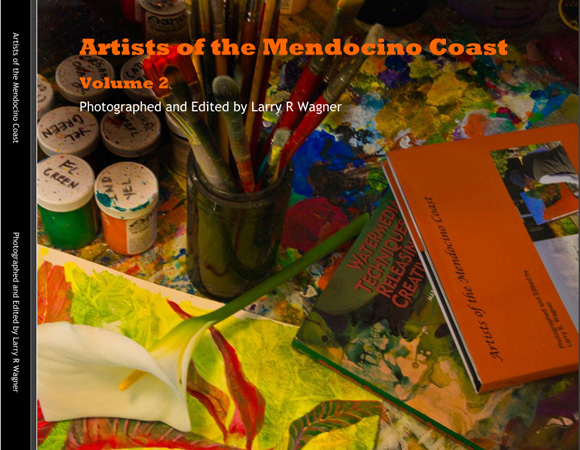 Artists of the Mendocino Coast, Volume 2 showcases another fifty-six incredible artists through their portraits, biographies, artistic statements, and samples of their art. The wealth of talent in this unique area is a treasure to behold. DREAMS flourish on the Mendocino Coast. Portrait photographer Larry Wagner dreamt of sharing the dreams of artists who live in this paradise. With camera and a warmth of personality, Wagner captures the essence of his subjects and gives recognition to their work. If anyone at the present time can be credited with being a mentor to the art community, it is artist Larry Wagner. During the past two years he has photographed 135 outstanding artists on the Mendocino Coast and brought the artist community together through art events, exhibitions, and his two books, Artists of the Mendocino Coast, Volume One and now, Volume Two. Artists work in solitude. Tucked away in studios or out in the field they paint, sculpt, weave, sew, chisel, photograph or explore other forms like ceramics, jewelry or glass work. Even at gallery events, artists might not know one another. Now there is a catalyst for them to meet, to laugh together, to exchange ideas and support dreams. Larry Wagner hopes Volume Two continues to enhance the success of our artistic community on the magical Mendocino Coast.